What is the easiest way to get started using databases with real data? I have a project that could benefit from using a database, but I have no experience with databases, don't have access to a server, and have relatively little experience working with things living server-side. If I'm going to have to tackle a learning curve, I'd prefer to learn something with broad applicability (such as SQL) but would settle for learning something like Access if it is sufficiently powerful for the task I'm currently trying to tackle. Of course, I'd also rather not drop $150 on Access if it can be helped since I'm just tinkering. I've downloaded LibreOffice Base as well as something called SQLiteBrowser, but I wanted to check first before I invest time learning those particular applications and their flavors of SQL whether those tools will be sufficient for what I want to do. run queries that equate to "select x where this is that and this contains that and any of these contain that"
Again, I'm willing to learn, but it would be nice not to have to learn a bunch of intermediate stuff about IT before I can focus on learning databases and, if necessary, the particulars of a given application. Stanford University had offered public course on databases last Fall. They had nice tutorial on how to set up SQLite. Once you start learning SQL you will need some tool using which you can build a database and run queries. SQLite is free software library which can be used to create databases and run queries. It can used as an independent tool i.e server setup is not required for using it. It also supports importing csv files. Once you are familiar with SQL, you can use MySQL if you want to design some web-application or access to build desktop applications. I do not think Microsoft Access is at all necessary (as it is not free) if you just want to get started with. You mentioned MS Excel in your comment so it's pretty much safe to assume you're in a Microsoft environment. You definitely have much power if you know how to mess with a database management system. If you're doing some serious data analysis, I'd say go for enterprise databases like Oracle, SQL Server, MySQL, DB2, etc., which are Relational Databases. It's good to note that there are also non-relational databases out there that are gaining traction in the database market. Since you're probably on a Microsoft environment, I suggest you go for SQL Server. You can ask your IT department if you have an enterprise database already in place. If none, you can download the "express" version of SQL Server (see link on the other comment). While you're there read about the limitation of an express edition. The express edition is FREE. If you think that there is a necessity for an enterprise-wide database in your company (assuming your company doesn't have it yet), go ahead and buy the Developer version. The developer version contains everything that the Enterprise version of SQL Server has. If you are testing what SQL Server can do in an enterprise setting, this is the version you want to get your hands on. Note that you cannot use the developer version for production. It's intended for testing only. The good thing is, when your company database is ready for prime time - production - you can easily "switch" the developer version to the licensed SQL Server instance. As you start learning SQL Server, it is just fitting to start learning TSQL, which is SQL Server's implementation of the SQL language. User Groups - there is this Professional Association for SQL Server (PASS). Good resource for anything about SQL Server - events, people, etc. Explore the site to learn what the organization is all about. #sqlhelp hashtag on Twitter - your helpline on Twitter. I suggest you start following those people that used the #sqlhelp tag - either they were asking for help related to SQL Server or answering a question. If you want to learn Access then go for it, but if your eventual destination will be an Enterprise database then it won't help you as quickly in that direction as other options due to its extensive GUI hiding the SQL. I know the title of your question including the word "easiest", but hear me out regarding the Oracle route. Not only is Oracle Express Edition (Oracle XE) free and available on Windows, but 99% of what you learn on Express Edition can be applied to Oracle licensed editions including Oracle Enterprise Edition. In addition, there are several features that make Oracle a good choice for small projects. Installing Oracle XE is easy and using SQL on Oracle is no more difficult than using SQL on most other platforms. The more difficult parts of Oracle come with larger systems that need administration. The things that make being a database administrator hard mostly do not apply to people in your situation. Oracle XE does not require a server (your workstation will most likely work fine). If you want to use your data from the csv or xlsx then you can read up on importing data from CSV, xlsx, etc. into MSSQL. There is a lot of resources on this so I won't link them here but a google search would suffice. It may be possible to solve your problems with some sophisticated excel features. Have you looked into Excel's Autofilter feature? It will allow you to narrow your results and answer the question show x where this is that and this contains that.... In order to get to "any of these contain that" I would suggest an additional column with a formula using the if() and find() functions which could then be filtered on. I use both Access and Excel frequently, and I'm not sure the complexity of your question would be enough for me to pull a spreadsheet into access, especially if the "source data" needs to stay in Excel for reporting and/or use by folks without access. Of course, your questions may be much more complex than your example suggests, and then database might be the way to go. I would highly recommend not going the Microsoft route and opting for learning SQL. You can easily set up a development environment on your existing hardware (whether you are running Windows, Mac or Linux). 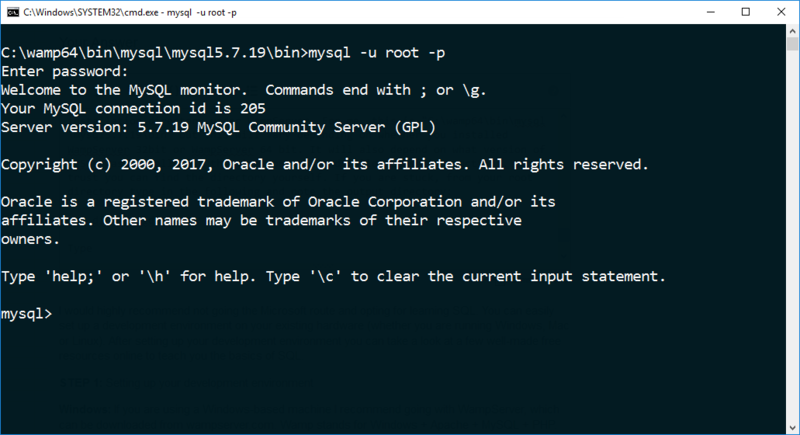 After setting up your development environment you can take a look at a few well-made free resources online to teach you the basics of SQL. 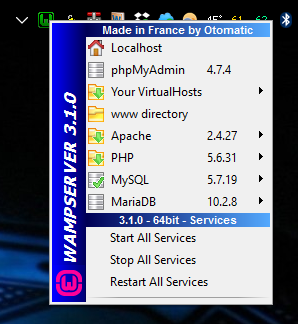 Windows: If you are using a Windows-based machine I recommend going with WampServer, which can be downloaded from wampserver.com. Wamp stands for Windows + Apache + MySQL + PHP. The advantage of this package is it will set up a self-contained environment with all the parts you need to test out development - or, in our case, learn MySQL in a hands-on manner. 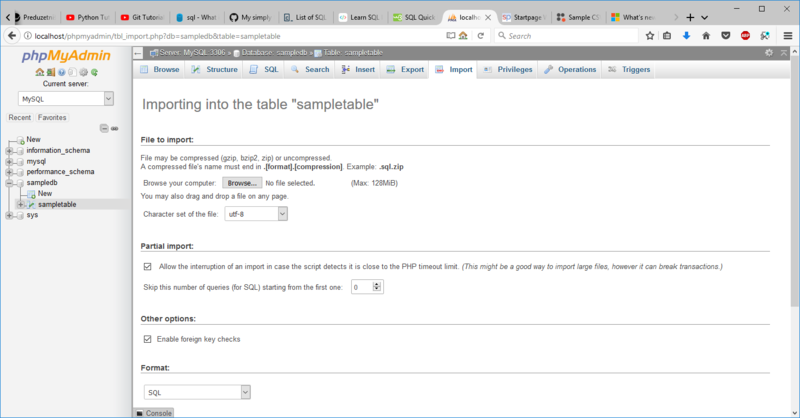 It also comes with phpMyadmin for an graphically based alternative to interacting with your databases. NOTE: Make sure to have the all the appropriate Microsoft Visual C++ Redistributable packages installed on your system. You can find these on the WAMP website, or you can see these recommendations during the WAMP installation - along with all necessary download links for the packages you are missing. Make sure to install them first before finishing the WAMP install. I'm going to continue this tutorial assuming you went with the WampServer solution (based on your talk of Microsoft solutions). After WampServer is installed launch it and wait until the server shows up in a green color in your taskbar. This means it is active and working properly. 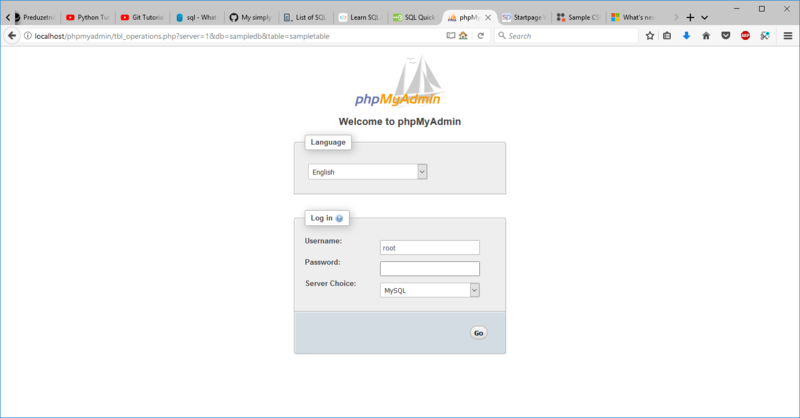 Next, login to phpMyAdmin with the defult username and password, which is "root" (without quotes) and a blank password. This will launch mysql with the username "root". You will be prompted for your password (which is blank by default). Simply press ENTER. Not the answer you're looking for? Browse other questions tagged database-recommendation ms-access or ask your own question. Why is Database Administration so hard? What features of Oracle make it an attractive choice for small projects? what is the best way to update 2 tables via data entry form in access 2007 database? In what way are Access tables linked with SQL server? What is the best design for storing courses subscription data? Comparing each rows with the above row in Access and based on the results (= or <>) inserting different data!